﻿ Hotel du Palais de l'Isle Annecy. JIMAT di Agoda.com! Hotel ini terletak di tengah-tengah bandar Annency, beberapa langkah dari istana. Ia menawarkan bilik-bilik yang dihias secara individu dengan pemandangan terusan, istana zaman pertengahan atau bandar. Setiap bilik penginapan berpenyaman udara di dalam bangunan abad ke-18 ini mempunyai TV satelit, akses internet Wi-Fi dan bilik mandi peribadi. Palais de l’Isle menyajikan sarapan bufet harian dan para tetamu dijemput untuk bersantai sambil menikmati minuman di bar. Hôtel du Palais de l'Isle terletak hanya beberapa minit berjalan kaki dari Tasik Annency dan katedral. Lovely little Hotel in the old town of Annecy and very central to exploring the wider city and lakeside areas. Reception staff and breakfast staff brilliant-very friendly and helpful. Buffet continental breakfast excellent value and choice. Hotel room was compact, however clean and comfortable. Bathroom very clean and well maintained. Only downside was the Hotel Air conditioning central system had not been activated. Very warm weather meant we attempted to open the window, however, the streets below are very busy and noisy with people until 3 or 4 AM. 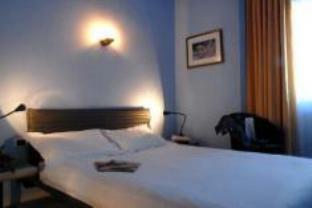 Location, friendly staff and cosy room. We had a very enjoyable stay at Hotel du Palais de I'Isle. The location is perfect, right in the center of the old town, walking distance to everything you need and want to see. Small but comfortable/cosy room. Nice bed and bathroom. 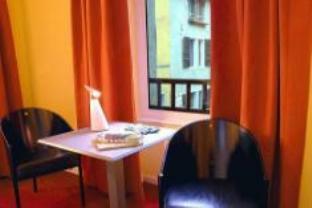 We stayed 1 night and we certainly enjoyed the very central location in the heart of Annecy. The service was good as well and facilities ok. I would recommend the hotel if not for its price. I expect a little more for 122Euros for 2 pax, for example, shower curtains to avoid flooding the whole bathroom, or nicely painted walls (not scratched), or at least breakfast included. It was my first time in Annecy though and I cannot really compare with other places. Everthing proved to be all right. small room for Euros, but however dog allowed and excellent location makes up for everything. Breakfast rather poor compared to todays international standards, however good quality (ham) and kind staff. Unfortunately no proper car park and no possibility to drop luggage in front of hotel. Definitely a romantic place to be with a fantastic view throughout the city. The food is excellent not to mention the ice-cream and coffees. Highly recommended. Old fashioned. Narrow corridors with steps making it very difficult to bring luggage. The hotel is located by the canal in the very centre of the old town. You can not park nearby the hotel thus you have to park in the public parking 500 metres away. Be aware that the hotel has very narrow corridors with steps making it a bit difficult to bring heavy luggage. Some front romms have a very nice canal view. Parfait! Sauf la baignoire sans paroi qui fait que l'on a tendance à inonder la salle de bains..